Photograph 1 - Boston State House - next to the Boston Common. Photograph 2 - Sitting at the Boston bar where Good Will Hunting actors sat - Matt Damon and Ben Affleck. 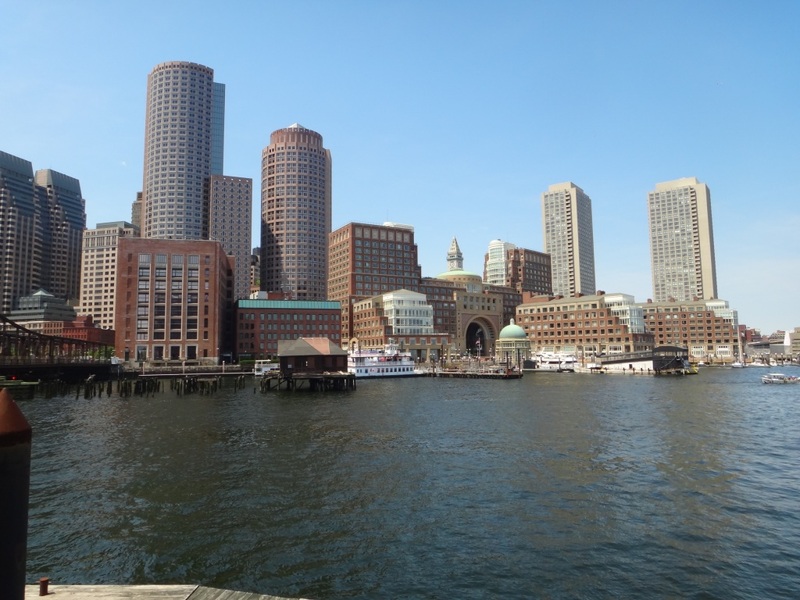 Photograph 3 - Boston on a clear day - not far from where the Boston Tea Party happened. 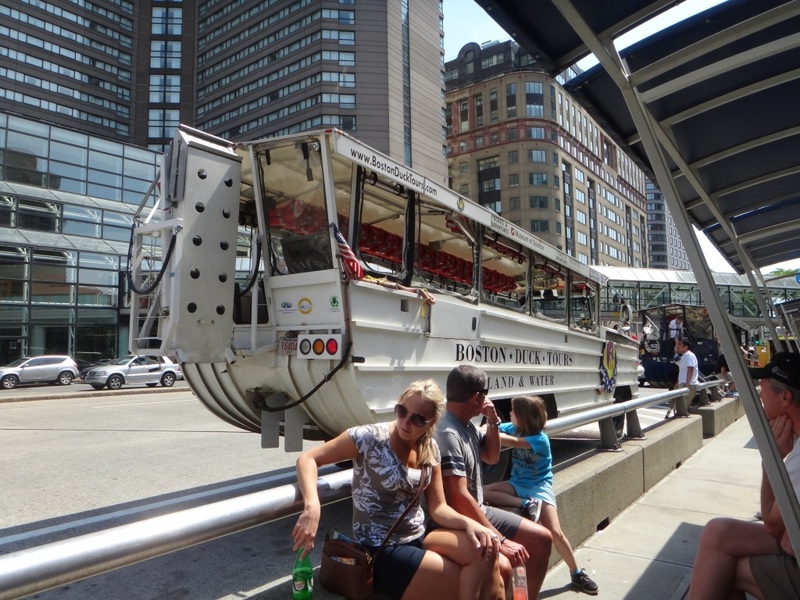 Photograph 4 - Our Boston DUKW (Duck) vehicle - travels on land and in water - a great way to see Boston. 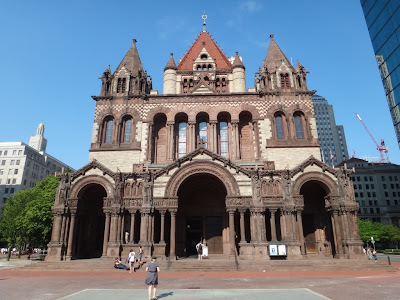 Photograph 5 - Trinity Church - one of Boston's most prized buildings. Photograph 6 - Boston Downtown from the Public Botanical Gardens. Photograph 7 - In front of Cheers - where's Sam Malone and Norm?? ?------------------------------------------------------------------------------------------------------------------------------------------------------------------------------------------------------------------------------------------------------------------------------------------------------------------------------ It was a good time to sleep in this morning and woke to a beautiful Boston morning. 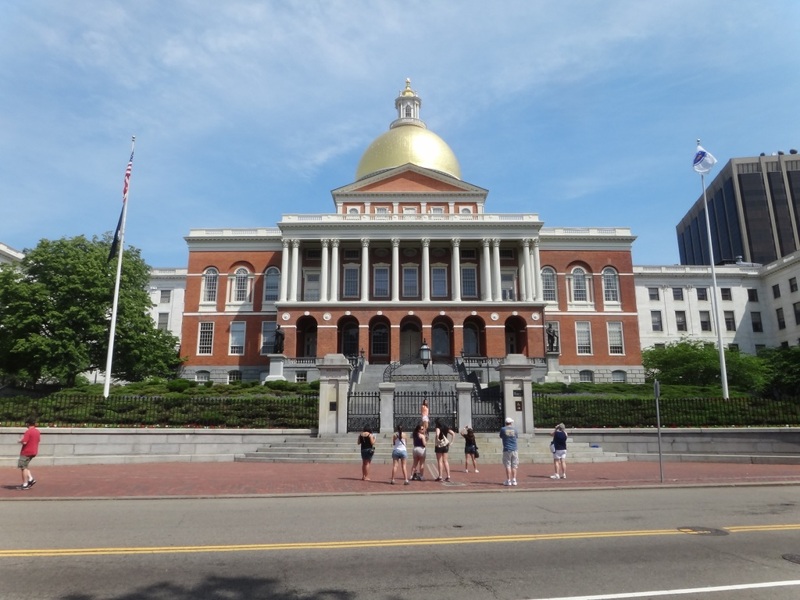 We arranged a light breakfast from a convenience store and sat in the Boston Common waiting for our 11am Movie and TV Tour of Boston. This tour took three hours and visited many sights of American TV locations we have not heard about. Only the TV series Cheers was recognised and two movies: Good Will Hunting and The Departed. There were others however we have or had never seen the shows or movies. The highlight was Cheers. The front entrance s actually what it is in the show....but...once inside there is no similarity to the bar that was in the show. In fact it was done with a live audience in LA! 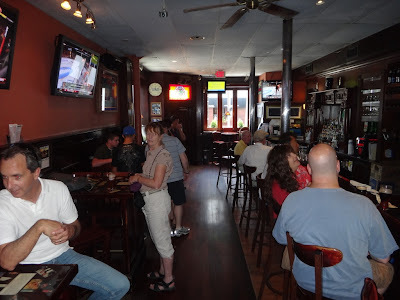 Not to miss out on additional income the hotel next door have their bar done out like the one in the TV series. We finished our tour at 2pm and taxied to our next experience - the Boston Duck tour. 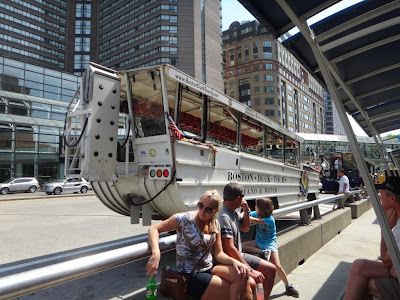 What a great way to see Boston - from land and water in an old WW2 amphibious machine. This took 90mins and well worth the dollars spent. We saw most of the historical areas and seen Boston from Charles River. What made it even special it was on a clear day and therefore memorable. 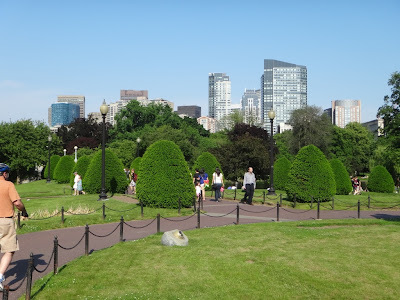 Because it was such a warm and clear day (the sun sets at 8pm here in Boston at this time of the year) we walked back through the Botanical Gardens and Boston Common. In was in the later we saw over 35,000 small US flags in preparation for Memorial Day tomorrow. These flags represent the amount of Massachusetts servicepeople who died between the American Civil War and today. We had dinner at the same restuarant as last night - we can't beat the Clam Chowder and......lo and behold...... Anne did some shopping at Macy's. Tomorrow we start our three day bus tour of Niagara Falls and Toronto. This was arranged by a tour group and we may not have access to the Internet. If not we'll place all the niceties and stories on our return to Boston on 30 May. 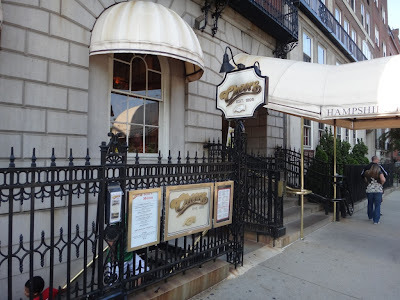 Until next time - cheers - still can't find Sam Malone in Boston! !